Name: Counseling Center of the North Shore Hosts 125-year Anniversary Gala at the Orchid Show at the Chicago Botanic Garden. 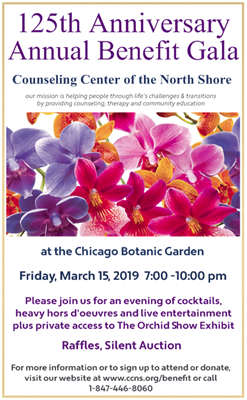 Counseling Center of the North Shore (formerly Family Service of Winnetka-Northfield) will host their Annual Benefit and Auction Friday, March 15, 2019 at 7:00 p.m. The event will be held at the Chicago Botanic Garden at 1000 Lake Cook Road, Glencoe. The event, “125th Anniversary Gala”, will feature an open bar, heavy hors d’oeuvres, exclusive access to the Annual Orchid Show, and entertainment by singer Gina Nunez. Cost is $125 per person and all proceeds go to the Counseling Center of the North Shore. In addition to food and live music, the evening will feature an exceptional silent auction including unique opportunities. For information and to purchase tickets to the event go to www.ccns.org/benefit or contact Colleen Schoppman at (847) 446-8060 or Colleen@ccns.org. The Counseling Center of the North Shore (CCNS) is a nonprofit mental health and wellness center located in Winnetka. The CCNS mission is Helping people through life’s challenges and transitions by providing counseling, therapy, and community education. Chicago Botanic Garden at 1000 Lake Cook Road, Glencoe. $125 per person. Tickets to be purchased in advance of the event.